This batch file will process a directory of .AVI files, leveling the audio volumes, and creating new AVIs. The source AVI files are not changed in any way, so if you aren't happy with the results - no harm done. Note: It won't work with every file - older DivX 3 and h264 files with almost certainly fail. Avi_Gain_Lossless.bat --- Runs Mp3gain on demuxed mp3 file, then muxes back into AVI. No recompression done on the original audio source. This one is good for mostly musical performances, as it maintains the dynamics of the original. To use this batch file, the audio track in your AVI must be MP3 to begin with. Avi_Gain_Soopa_Loud.bat --- For those who haven't had an ear wax removal session for some time. Sounds like the dynamic range compression of FM Radio, although it can be quite effective on certain audio sources. Try it out. 2) Place your AVI files to be processed in the same folder as the avi_gain apps. The normalization is intentionally set to conservative settings to avoid clipping. I haven't used this, but I'd just advise not trusting it too much. I've had some dramas that had their levels very low. Examining them I found a noisy passage (eg, gunfire) and it seems likely some levelling was done, set to avoid clipping. But I'd rather have distorted gunfire than muffled speech. I found MP3Gain very good for fixing this, it warns if you're going to clip but lets you go ahead. But you need to demux the MP3 and remux. However, it is completely lossless as it just changes some MP3 parameters and doesn't transcode. If I have a batch of TV episodes, I can demux and then equalise them by ear, eg by matching the theme music volume. There are 2 reasons I didn't go with Mp3gain (and I tested quite a few normalizers before I posted this Mini Guide). 1) When processing a folder of AVIs, not all of them used MP3 as the audio track. As a result of years of experimentation, I had AVIs with AC3, OGG, MP2 audio tracks, and I'm guessing I'm not the only one. So merely demuxing and applying MP3gain.exe wasn't going to cut it. 2) MP3gain works if your player supports it; if it can decipher the tags that MP3gain embeds in the file. And while most software players do support it, not all hardware Divx DVD players do. My goal was to make the batch work properly for the vast majority of folks who were going to use it. And as noted above, the source file isn't touched. If you're not happy with the results, you can always go back to square one. As far as general normalization techniques are concerned, the issue once again becomes "how do you ensure most people will be satisfied with the results". I do know that clipping and distortion aren't pleasing to the ear, and with an automated process, I had to err on the side of safety. I intentionally made the batch file as simple as possible for customizers to tweak it with whatever app/process they prefer, as I knew this thing might open up a thread of debate and controversy. 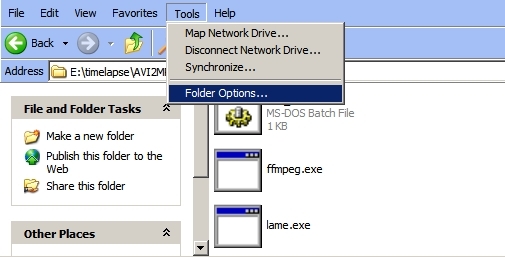 If you look at the documentation for the Normalize.exe file, you'll see there are quite a few parameters that can be modified to suit your specific tastes. Or, you can completely replace the executable with one of a dozen other normalizing/limiting command line apps out there. i read the normalize.txt and seems very very cool. reading what you can build,can you do one "GUI" or write one single command line to use in one wave(music) please? i "swear",i'm horrible in command lines! If you only want to normalize Mp3s or Wavs, search for Mp3gain and Wavegain. Both have GUIs. wavegain i know(and don't like),normalize is seamless...better? thanks so much for fast answers!!! There are 2 reasons I didn't go with Mp3gain (and I tested quite a few normalizers before I posted this Mini Guide). 1) When processing a folder of AVIs, not all of them used MP3 as the audio track. As a result of years of experimentation, I had AVIs with AC3, OGG, MP2 audio tracks, and I'm guessing I'm not the only one. So merely demuxing and applying MP3gain.exe wasn't going to cut it. I know MP3gain isn't a panacea. Still most AVIs seem to use MP3 sound these days. But I like its approach: it analyses the files and recommends a level. You can override that. Because just involves writing a few fields in the MP3 file it's lossless and extremely fast after the initial analysis and you can twiddle the levels and skip between tracks and listen to them until you're happy. If you're not happy with the results, you can always go back to square one. I wish people would actually review the results. Probably an automated technique gives acceptable results most of the time, but not always. 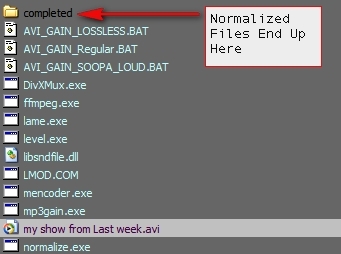 If you look at the documentation for the Normalize.exe file, you'll see there are quite a few parameters that can be modified to suit your specific tastes. Or, you can completely replace the executable with one of a dozen other normalizing/limiting command line apps out there. I looked at the docs; as far as I can see it does analyse the entire file. For soundtracks, as opposed to musical tracks, the ideal would be a way to normalise based on a specified section; e.g. the first 5 minutes, and/or a flag to ignore transient loud sections in collecting the maximum. What I actually want is it to just look at the spoken word sections. All the normalising apps I've seen (not that I've tried all of them) seem to be assuming music. I'd been looking for something to do the same thing. i think I've found another solution to the problem, for playback on a pc anyways this is a piece of software that automaticly adjusts the volume. it's freeware. I havn't tested it yet, but it should solve my problem. however it wount do anything for burning video and playing it back on a standalone player. please check it out if you like. here is the link. and thank you all for the help you've provided me in the past. "To get AutoMixer registration key for free to your email, enter your email and press "Send AutoMixer registration" - it will be sent to you immediately. Also you will subscribed to F-Group newsletter to get information about new releases of AutoMixer. Latest letters available in newsletter archive"
Hey, how about testing it out and reporting the results ? Thanks ! Update: Added New Methods to Normalize Your AVIs, including lossless gain. See first post for new download URL. The batch file(s) also works quite well at "fixing" AVI files that don't allow you to scrub through them (corrupted indexes). So, I downloaded this program, but when I put my Divx video in the folder and try to do anything, I get nothing. I'm dragging the video file over the avi_gain program and trying to ope it with it, but to no avail. The only icon that partially works is the mp3gain one, and even that stops at 4%. Any idea of what I'm doing wrong? Does this even work for Divx movies? Drag into same folder. Double click AVI_gain.bat to process. No spaces in file names. It is a script, not a GUI. Don't drag the file on top of the Avi_Gain.bat file. I just (past 5 minutes) uploaded v03 of the script, which has a higher quality MP3 encoder. Okay, I've tried to do what you said, but to no avail. I'll post a pic of my folder and maybe that will help. Nice, It works now. I changed the .divx extension to .avi. Now lets see if I can churn through this baby. Thanks for all the help man; you're pretty smart with this stuff. Thanks for the kind words. Yeah, you can put as many files as you want in that folder, it'll process them all, just make sure you have enough disk space to handle it. The LossLess_Gain.bat file is faster, but not as loud as the other one. BTW, download the updated version I posted v03 - It'll probably work better with your player. So the new file that is output will be louder than the original? If I wanted to keep making the file louder, could I just keep normalizing the file or is there a threshold for how loud they can be? Oh, you can go a lot louder, but then you risk distorting. Gimme 5 min and I'll upload an even louder version. Normalising is not making louder; it may booost or reduce the volume, trying to make a consistent volume that doesn't distort, over a track or a collection of tracks. If you normalise again with the same settings, it should not change at all. So if you just want to apply gain, it's not normalising. Here you go - now there is regular loud and soopaloud. I set it up to be careful at analyzing the audio and doing a clean sounding encode, but that also means it'll take a few minutes longer to process the file. Still, it should sound great when it is done. Soopaloud adds a process called Limiting, which will make the quiet parts louder and the louder parts pretty much the same. Remember, your original files aren't touched, so no problemo if you're not satisfied with the sound. Thanks! this has been a tremendous help. I watch these movies while I'm at the gym doing cardio, and it's a bit hard to hear them with 10 other people running on treadmills around you. You've just solved a problem that's been plaguing me for a long time. I'll be sure to stop back through once in a while and see what's going on. Thanks again. looks like a solution for me. what would i change in your script to make it process the avi file with spaces in the names? Hee hee. I've been planning on fixing that - Microsoft's fault, quite honestly. pcspeak (who writes kick @ss batch files) demonstrated an interesting workaround for that problem. I'll get around to it, but it'll probably take a few days. v05 updated to support AVI files with spaces in their name (thanks for the inspiration, pcspeak). Also updated the re-muxing routine to a better app. See top post for more info. Highly recommended, it fixed my mp3 encoding problem which was creating out-of-sync audio in videos. The only downside is the DivX Multiplexer spamming up the Junk User Metadata, but which i only notice when i check out the resultant file in GSpot. AVI to iPhone, multiple files after encode, no audio?